I wanna feature on a Callcard! I'm sure like many, you've once wondered what it would have been like to feature or advertise your business on a Callcard? 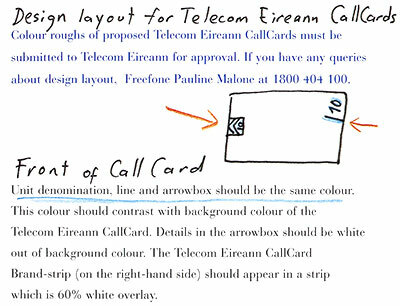 Recently on Callcards.ie, we came across a booklet that was distributed with select number of the Telecom Eireann Blank Promotion Callcard (1230) in 1999. Read more about I wanna feature on a Callcard! First of all, apologies for the delay in uploading images of Callcards to the Callcard Database. We've got a few comments to the website in relation to the shortage of Callcard images in the Database. As you can imaging, a lot of work goes into getting the images prepared. It takes an average of 15 minutes per Callcard (inc back), when you consider precise cropping, rounding of edges and touching up blemishes/scratches etc.